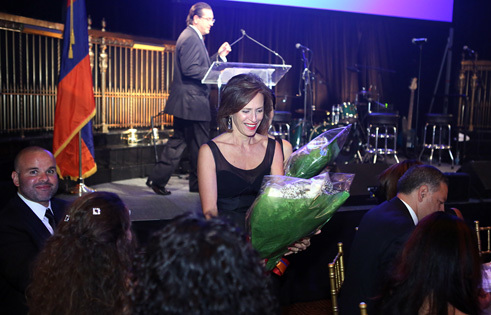 New York, NY — With such an outpouring of kudos and bravos for the recent Armenia Fund USA Gala, which took place on September 29, 2012 at the New York City landmark Gotham Hall, Armenia Fund USA would like to recognize the special work done by the Gala Committee Chairwoman, Vesna Markarian of Cliffside Park, New Jersey. Mrs. Markarian with her daughter Aline Markarian. Active in both the Armenian-American and non-Armenian charity circuit, Mrs. Markarian graciously accepted the demanding volunteer position of Gala Committee Chair to help make the 20th year milestone celebration truly worthy of the occasion. He also cited that she had chaired the Charles Aznavour event in New York for Fund for Armenia Relief (FAR) and this experience proved helpful and relevant for the Armenia Fund USA gala, which featured French-Armenian entertainer Patrick Fiori and his band. They had flown in from Paris for two nights just to do a benefit performance for Armenia Fund USA. “Mrs. Markarian was uniquely equipped to make sure that our featured guests and those in our audience would be impressed with the professionalism on display throughout the evening,” Mr. Bandazian stated. Vesna Markarian is the wife of Alex Markarian. The couple was also most gracious in donating the magnificent flower arrangements for the cocktail reception. They have two daughters. 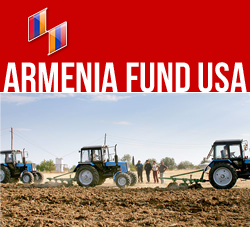 The Armenia Fund USA board of directors also wishes to thank the entire Gala committee team, including Kristine Toufayan Casali, Alex Karapetian, Aline Markarian, and Lorig Setrakian. Their efforts went a long way to enlarge the organization’s base of young professionals who, by all accounts, were inspired and energized by all that transpired during the four-hour celebration.